DOGOPOLY – Get Out of the Pound Free! Play "DogSpin" and try to break the bank. DogSpin will run on any system that supports Microsoft's DotNet Framework (such as Windows XP with Service Pack 1.) The Framework is available for free download from http://msdn.microsoft.com/netframework/downloads/framework1_1/. Enter a bet between 1 and your stockpile total and click on the [Spin] button. If one of the winning combinations appears, you get the amount you bet times the payout. To see the payouts, click on the [Payouts...] button. If your total reaches 20,000 you've broken the bank and the game is over. For more fun, challenge a friend by running the game twice and seeing who breaks the bank first. Beating your friends real badly? 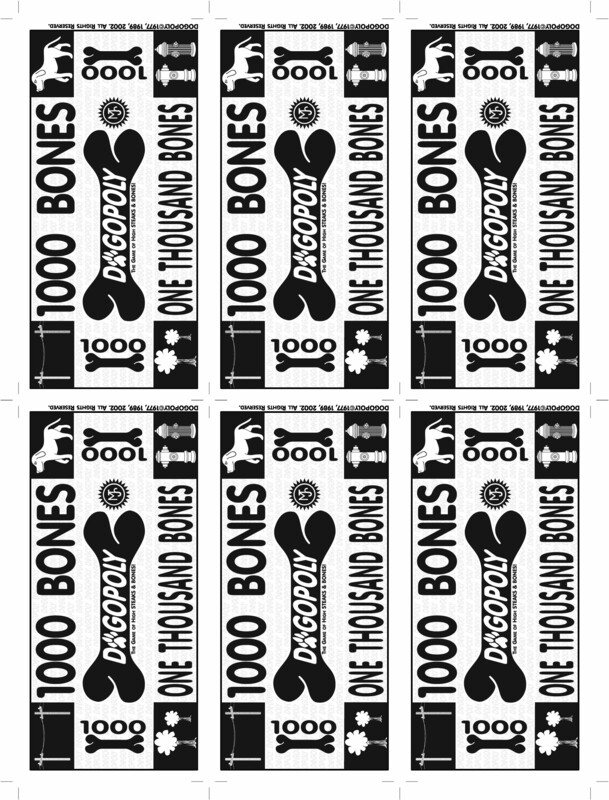 Download our 1000 bones currency! We couldn't fit it in the game, so here is the 1000 Bones currency. You'll need it! We don't call this The Game of High STEAK & BONES for nothing! Prints 6 on one regular page of paper! Stay tuned for some more free stuff coming soon! To get notified about this and other great DOGOPOLY happenings, make sure to join our e-mail . Visit the DOGOPOLY discussion Q&A group. Check out existing questions, or join and enter your own questions. Website ©2002-2005. Spahits Games. All rights reserved.